The year is 2026 and Daniel White has come to terms that he isn’t a normal man. It could be the fact that he has super strength and can tolerate hot and cold temperatures no human could. It could be the fact that he has two hearts and burns whenever he touches anything silver. Or it could be the fact that he has been running from the government who want him for his abilities, yet will not explain the reasons why. However, he finally receives answers when a beautiful woman approaches him and confirms his suspicions: he isn’t normal because he is not even human and both of them are from another planet sixteen light years from Earth. She has found him to train him to use the special abilities their race holds so that he may fight against a mutant oppressor who escaped from prison and is now on Earth… looking for him. New writer Craig Wainwright has entered the world of science fiction with his recently published debut The Last Titan. Not only do readers get a story that has a whole new planet and new alien races, but there is a superhero element present, as well. Yes, after reading the synopsis of the story, readers may think that it is a predictable story and yes, it can be at times, but The Last Titan as a whole is far from being the same predictable story readers may be anticipating and Wainwright has succeeded in areas many who have tried to write science fiction fail in. Not to mention Wainwright’s knack for storytelling and his amazing use of descriptive detail and personification will make readers want to keep reading and learning more as the story plays like a Marvel movie within their minds. One of the biggest struggles when writing science fiction is creating new alien races and new worlds. So many have been created already and it can be tricky to think outside of the box. Wainwright most certainly thought out of the box and was able to create his unique planet that is orbiting twin stars in Ursa Major sixteen light years from Earth: Hellas. The story jumps back and forth between Earth and Hellas and while readers do not get to witness too much of Hellas’ surface, they do learn much about the customs of the planet, the history, stories about past events and people, a prophecy about potential hard times coming, and about the different races residing on the planet. Of all that is within the story, Wainwright is to be commended on the alien races he created. While some writers play it safe and create one, maybe two races, Wainwright has created ten. Each of the races are briefly introduced, but it is amazing to hear how unique each one is. Wainwright does an amazing job describing how the races look, what each race specializes in and their unique abilities, and how they interact and help one another. This is incredibly impressive and fascinating to read about and will make readers want to learn more about each of the different races. The main race focused upon in The Last Titan are the main inhabitants of Hellas: the Hartos. They are an inspiring race of human-looking beings that have two hearts, piercing green eyes, one love that they are connected to before birth, special abilities that act like super powers, and they are allergic to silver. This race is the one that really gives the superhero element to the story for what they are capable of can only be described as super powers. What is refreshing about the Hartos’ powers is the fact that Wainwright refers to them as abilities, not powers, and each ability mentioned is different than the super powers that have been used countless times in other movies and comic books. The characters themselves are well-developed, inspiring, and have more heart and determination than one could possibly imagine. Take Andromeda, for instance. She is a powerhouse woman character male and female readers will fall in love with. She is courageous, strong, and caring, yet her stubbornness does get the better of her at times and clouds her judgement. Then there is Daniel who knows how to use his strength to help others and has a fun cheesy way of acting like a valiant knight in shining armor. These two make quite the team and are a force to be reckoned with. Neither one plays the damsel during a fight and, when a fight does become too difficult for one, the other will jump in to help. Wainwright makes his debut with The Last Titan, an out of this world action-packed, cleverly written, and imaginative science fiction adventure. It is a story that will please fans of the science fiction genre with a new planet and the unique races that reside upon it as well as fans of superhero stories with the different abilities the characters possess and a new battle of good versus evil. Wainwright’s excellent storytelling and his detailed descriptions will paint an amazing picture that will play like a movie within the minds of his readers. 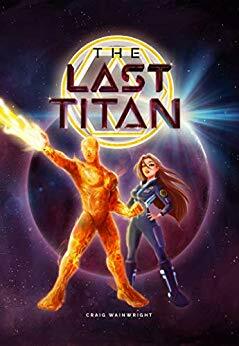 The Last Titan is an original and fun new take on a popular concept that holds countless surprises come the last half of the book readers will not see coming. It is also the first of a series Wainwright has planned for the near future and one readers will be anxious to read upon completing his debut.